If you go to the gym a couple of times a week and eat healthy, you can’t help but hear the word ”protein” whenever someone talks about their diet. Of course, we all know that protein is required to build and repair muscle, but many have gone a bit overboard with the amount of protein consumed and its perceived muscle building properties. There is a large gap between the recommended amount of protein and the actual need. Let’s look at the facts. Because protein is just one group of macronutrients, we need to start looking beyond the typical protein intake for sports nutrition. 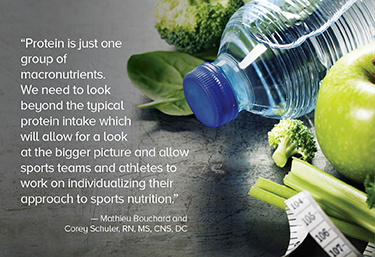 This will allow for a broader look at the bigger picture and also allow sports teams and athletes to work on individualizing their approach to sports nutrition. How should the approach change? First, carbohydrates, and lipids will have to be carefully chosen to maximize the performance of an athlete. Gluconeogenesis or turning glucogenic amino acids and/or lipids into energy is efficient, but protein is probably the least favorable source of energy for the body. Athletes will need fuel to perform. This is one of reasons lipids and carbohydrates are important in sports nutrition. Carbohydrates and lipids are better selections for producing ATP and will yield between 36 and 38 ATP molecules for every one (1) gram. Carbohydrates are the preferred source of fuel, but may not be the best selection for every athlete in all cases. Athletes who have conditioned themselves to rely on fat as a fuel source (nutritional ketosis) are the exception. As for lipids, the structure of the fatty acids will determine its capacity for fuel. For example, palmitic acid is a 16 carbon fatty acid and it will yield around 130 ATP molecules per grams. Likewise, oleic acid is an 18 carbon fatty acid which will yield 146 ATP molecules per grams. Second, for most people, dietary protein will come from an animal source. If you only take into account the protein intake, how will you regulate the micronutrients intake? The large array of vegetables, fruits, nuts, starchy carbohydrates, etc. will have to be taken into account if you want maximal performance. Nutrient density varies between foods and over-reliance on a single macronutrient will affect micronutrient intake. Finally, for many, quantification has always been a big issue, but what about quality and diversification? We know that food diversity helps to increase nutrients intake but it also plays a major role in gut health and intestinal flora diversity.4 When we look at nutrition (or any aspect of human health), too narrow of a view will lead you nowhere. While some people may fare well on a high protein diet, it is not the case for everyone and athletes are no different. Diversity and quality should be more of a concern than the amount of any particular macronutrients. 1.Antonio J, Ellerbroek A, Silver T, Orris S, Scheiner M, Gonzalez A, Peacock CA. A high protein diet (3.4 g/kg/d) combined with a heavy resistance training program improves body composition in healthy trained men and women--a follow-up investigation. J Int Soc Sports Nutr. 2015 Oct 20;12:39. 2. Longland TM, Oikawa SY, Mitchell CJ, Devries MC, Phillips SM. Higher compared with lower dietary protein during an energy deficit combined with intense exercise promotes greater lean mass gain and fat mass loss: a randomized trial. Am J Clin Nutr. 2016 Mar;103(3):738-46. 4. Rodríguez JM, Murphy K, Stanton C, et al. The composition of the gut microbiota throughout life, with an emphasis on early life. Microbial Ecology in Health and Disease. 2015;26:10.3402/mehd.v26.26050.